Richard Falk, Palestine’s Horizon: Toward a Just Peace (London: Pluto Press, 2017). In his new book Palestine’s Horizon: Toward a Just Peace, Richard Falk provides a helpful summation of where things currently stand in terms of the Palestinians’ prospects for freedom from Israel’s occupation regime. The book brings clarity to the question of why a just peace has to date remained so unreachable while offering hope for a path forward. Richard Falk needs no introduction to those well read on the Israel-Palestine conflict, but for those unfamiliar, he is Professor Emeritus of International Law at Princeton University, a former UN Special Rapporteur for the situation of human rights in the Palestinian territories occupied since 1967, and a tireless voice for peace. Falk emphasizes in Palestine’s Horizon the abysmal failure of the world’s governments to make any progress toward a just peace. Actually, “failure” is the wrong word, since it implies intent to achieve a just peace, whereas government efforts to date have only served to sustain the status quo of occupation. As Falk argues, Palestinian prospects “rest on the activism of people rather than the diplomacy of governments and the United Nations” (pp. x-xi). To be effective, our activism must focus on “shifting the balance of forces” in a way that forces Israel “to recalculate its interests in ways that make it possible to envision a fair and sustainable political accommodation with the Palestinian national movement” (p. x). 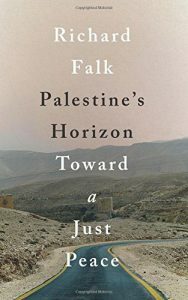 Throughout the book, Falk pays homage to the late Edward Said, who “was and in many ways remains the most passionate and influential voice of the Palestinian people, and indeed of people worldwide seeking liberation” (p. 120). Falk adopts Said’s reasonable assumption that, as Said wrote in 2000, “the only hope for the future is a decent fair coexistence between the two peoples based upon equality and self-determination” (p. 21). Proceeding from this foundation, Falk explains how the US-led so-called “peace process” has undermined rather than supported Palestinians’ rights. Citing another great Palestinian scholar, Falk rightly notes that the illusion of the US as an “honest broker” is shattered by Rashid Khalidi in his book Brokers of Deceit: How the US Has Undermined Peace in the Middle East—another book which I also highly recommend to anyone interested in seeing a just peace between Israelis and Palestinians. 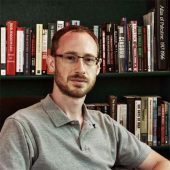 In this context, I’m honored that Falk also refers to my own book on the US role, adding that “This outcome has been elaborately confirmed in Jeremy Hammond’s Obstacle to Peace, which if fairly heeded would put an end to this double coding of American diplomacy pertaining to the Palestinian national struggle” (pp. 24-25). Falk also emphasizes the unquestionable legitimacy of the Palestinians’ struggle. Indeed, its legitimacy was recognized even by Zionist leader and first Prime Minister of Israel David Ben-Gurion: “‘If I was an Arab leader,’ he once confided to Nahum Goldmann, ‘I would not make terms with Israel. This is natural: we have taken their country. They only see one thing: we have come here and stolen their country. Why should they accept that?” (pp. 33-34). Of course, while recognizing the legitimacy of the Palestinians’ struggle against their colonization project, Zionist leaders like Ben-Gurion rejected their equal rights. “Zionism at its heart”, Falk observes, “is about maximizing territory of the land of biblical Israel, not about finding formulas for mutually acceptable coexistence on the land” (p. 34). The British government, too, rejected Palestinians’ rights during the Mandate period with the policy course determined by its infamous Balfour Declaration of 1917 (p. 39). Falk advocates a “single, democratic, secular state, based on equal rights for all those resident in the country”; but, he correctly points out, “Of course, realistically, this one-state variant on Palestinian self-determination is not feasible in the current political atmosphere, since it would mean the end of Zionism…” (p. 36). 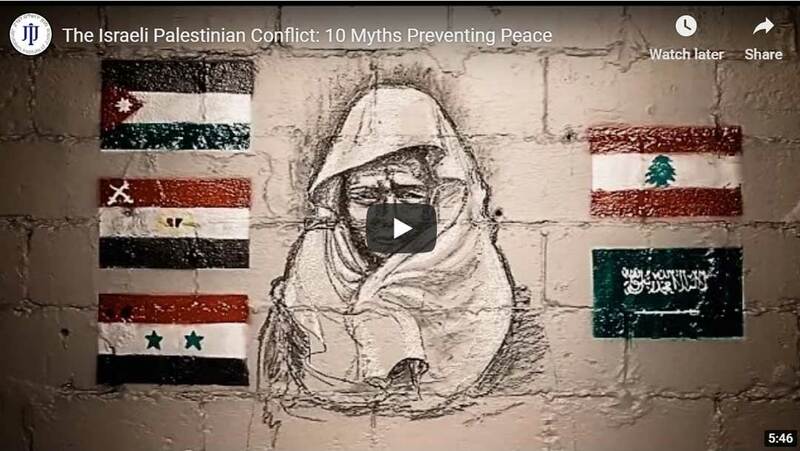 That is an important point to emphasize: from the start, the Zionist project was incompatible with respect for the rights of the majority Arab population of Palestine. This incompatibility manifested in the ethnic cleansing of most of the Arab population from their homes in Palestine in order for the “Jewish state” to come into existence in 1948. Returning to the US-led so-called “peace process”, Falk points out how “The learning experience for those supporters of the Palestinian struggle of the last 20 years is that inter-governmental diplomacy is not currently a pathway to a just peace, but rather a sinkhole for Palestinian rights. The Oslo/Quartet process has facilitated Israeli expansionist designs, confiscated land, building and expanding settlements, and changing the demographics of the occupation, especially in East Jerusalem” (p. 42). Nevertheless, “it is the Palestinians who are given the lion’s share of the blame when diplomatic negotiations break down” (p. 43). This hypocrisy is all the greater in light of the fact that it has always and ever solely the Palestinians who have offered any concessions; in the proper framework of international law and what the parties have a right to, as opposed to what Israel wants, Israel throughout the “peace process” has offered no concessions whatsoever—least of all with respect to land. Indeed, as Falk observes, when in 1988 the Palestinian Liberation Organization (PLO) accepted the two-state solution to the conflict on the basis of international law, it in effect “overlooked the unlawful acquisition by Israel of territory by forcible means in the 1948 War” (pp. 38, 61). Throughout the “peace process”, the hypocrisy of the Israeli government has been matched only by that of the United States. As the author of a highly detailed and meticulously documented book on that specific subject, I wholeheartedly agree with Falk’s assessment that the “perpetuation of unconditional support by the US Government, especially Congress, which gives Israel little reason to feel bound by international law, UN authority, and international morality, and has resulted in impunity in relation to Israeli refusals to abide by international criminal law” (p. 44). Falk emphasizes that now “is a time to take stock, and reformulate a vision and strategy to guide the Palestinian struggle”; it is “a time for the renewal of struggle and for a deepening of solidarity on the part of those of us who seek justice for the Palestinian people” (p. 43). Developments under the Trump administration since Falk wrote those words have only served to reinforce their relevance. 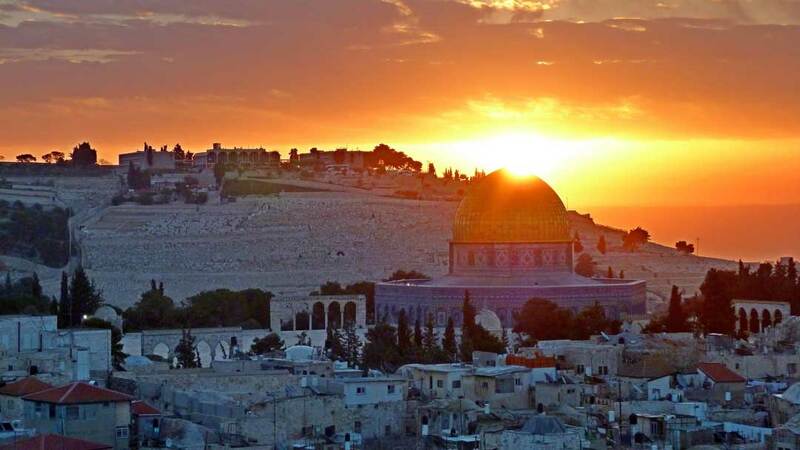 Palestine’s Horizon is an invaluable contribution to the public discourse precisely because it goes so far in the way of doing that work for us. Strategically speaking, Falk describes “a crucial shift” toward “greater reliance on a ‘Legitimacy War’ being waged by the Palestinian people to secure their fundamental rights. The essence of this war, waged on many global sites of struggle, is to gain control over the discourse relating to international law, international morality, and human rights as it relates to the Israel-Palestine conflict” (p. 45). This strategy can be effective because it enables “a significant neutralization of hard power advantages in a political struggle involving such fundamental rights as that of self-determination” (p. 47). Naturally, both Israel and its superpower benefactor are concerned by this strategic shift. Indeed, “This relevance is increasingly acknowledged by Israel itself, which has shifted its concerns from Palestinian armed resistance to what it calls ‘the Deligitimation Project’ or ‘lawfare’…” (p. 48). Falk provides an important caveat to this perceived shift away from armed resistance toward the Legitimacy War, which is the long history of Palestinian reliance on non-violence to resist oppression. While we are oft told that Palestinians could get what they want if only they would denounce violence, it is frequently those resisting the occupation through nonviolence who have been most brutally repressed (p. 51). A disturbing reaffirmation of that has come very recently with Israel’s shooting of unarmed demonstrators in Gaza. The Palestinian Authority (PA), for its part, has collaborated with Israel in repressing nonviolent Palestinian resistance (p. 66). Indeed, as I show in Obstacle to Peace, the PA was conceived by Israel and the US from the beginning as an administrative body that would serve as Israel’s collaborator in enforcing the occupation regime! That is a salient fact warranting particular emphasis, since it almost entirely overlooked in the public discourse. The only time any hint of this truth becomes manifest in the New York Times or other mainstream media is when the Israeli Defense Ministry is opposing cutting funding to the PA—an awkward bit of news to explain without filling readers in on the necessary context regarding the intended role of the PA under the Oslo “peace process”. The occupation, of course, is always framed by Israel and the US in terms of Israel’s “security”. Under this framework, the word takes on a euphemistic meaning that basically encompasses whatever geopolitical goals Israeli policymakers envision. Every violation of the rights of the Palestinians is justified under the umbrella of Israeli “security”. Every Israeli war crime is committed in “self-defense” against Palestinian “terrorism”. A stark rebuke of this practice came in 2004 when the International Court of Justice (ICJ) issued its Advisory Opinion on the wall Israel was constructing in the West Bank. About 85 percent of it is built on Palestinian land, and the territory on Israel’s side of it amounts to 10 percent of the West Bank (p. 66). In that ruling, the ICJ “determined that Israel’s right to security cannot be invoked to override the right of Palestinians to self-determination” (p. 56). It is not the security of the citizens of Israel that is of paramount importance to the Israeli government, but Jewish control over the land, which happens—regrettably, in the minds of Israeli leaders—to be already inhabited by Arabs. 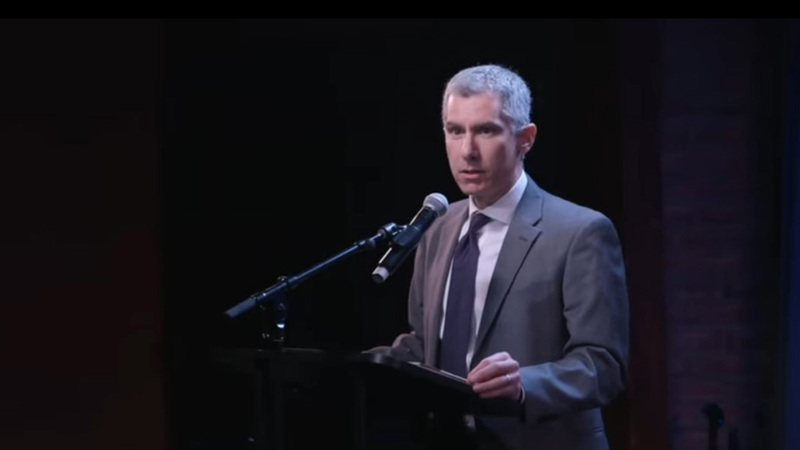 In the context of the Legitimacy War, Falk discusses a wide variety of important non-violent tactics, but the one he seems to place greatest emphasis on is the global boycott, divestment, and sanctions (BDS) movement, which “seeks to make Israel and the United States rethink and recalculate their sense of ‘the feasible’ in light of the mounting costs and dangers associated with continuing the denial of fundamental Palestinian rights” (p. 37). Israel, of course, frames the BDS movement as an attempt to “delegitimize” Israel. This response presupposes that Israel was established through some kind of legitimate political process. It was not. Rather, it was established by war and the ethnic cleansing of Palestine, which was the ultimate manifestation of the Zionists’ rejection of the Palestinians’ right to self-determination. Since discussing the matter within this framework of rights would be counterproductive, Israel must shift the narrative and therefore speaks in terms of Israel’s “right to exist”. The absurd concept of an abstract political entity having inherent “rights” has somehow managed to become accepted as dogma, so it also warrants emphasizing that there is no such thing as state’s “right to exist”. The proper framework for discussion is rather the right to self-determination, which it is Israel denying to the Palestinians, and not vice versa. Another of Israel’s responses to the movement was to pass a law outlawing free speech by subjecting individuals to penalties for expressing support for the BDS campaign (p. 85). Naturally, apologists for Israel’s occupation regime are also quick to denounce practically any criticism of Israel’s violations of international law and human rights as “anti-Semitism” (p. 115). Falk astutely observes the irony in the fact that “many European anti-Semites, who were prominent throughout the continent, shared with the Zionist leadership the belief that the way to solve ‘the Jewish problem’ was to support the establishment of a Jewish homeland in Palestine, and in keeping with the prevailing colonial mentality gave little thought to the impact of such a development on the indigenous Arab population of Palestine” (p. 117). The US government has joined in the effort by equating criticism of Israel with what the US State Department calls “new anti-Semitism” (p. 118). Falk, who is himself Jewish, notes that “this atmosphere of endowing smears of anti-Semitism with respectability” has “become threatening to academic freedom in the manner of Cold War McCarthyism” (p. 119). As Falk also observes, there are “all too few public intellectuals who challenge the prevailing wisdom of the society on the basis of conscience and truthfulness” (p. 123). In this context, Falk provides a great quote from Edward Said, who wrote in his 2003 Preface to Orientalism, “Above all, critical thought does not submit to state power or to commands to join in the ranks marching against one or another approved enemy” (p. 123). Sadly, there really is very little critical thought within the mainstream media. As an institution, the establishment media have in practice served state power. This is just as true with respect to coverage of the Israeli-Palestinian conflict as it was when the media served to manufacture consent for the planned US war on Iraq by uncritically parroting government propaganda. On the other hand, legitimate criticisms have been made of the BDS movement. This brings me to the first of the two points where my own view diverges substantially from Palestine’s Horizon. Among the the movement’s critics are Noam Chomsky and Norman Finkelstein. Both men are fierce critics of Israel who’ve made important scholarly contributions to the literature on the conflict. But because they do not withhold criticism of the BDS movement, they have in turn come under criticism from BDS supporters. One popular response from the movement has been to argue that those who wish to uphold Palestinians’ rights must defer to the Palestinians themselves on matters of strategy and tactics. Falk doesn’t speak of this internal dispute among what we may more broadly describe as the Palestinian solidarity movement (PSM), but he does echo the response of BDS supporters by writing that “it is important for non-Palestinian supporters to accept that its direction and political approach should always remain under the direction of its Palestinian organizers. It is important in this regard that those of us who are not Palestinian, yet lend support to BDS, reject Orientalist efforts to substitute our West-centric guidance for theirs. In this regard, non-Palestinians active in the PSM have a political responsibility to defer to the lead of Palestinian civil society who currently best represent Palestinian democratic aspirations” (p. 78). When confronted with this reasoning, Noam Chomsky has responded that if your friend asks you to do something that you know would end up causing him harm, it is right to refuse the request so as not to inflict harm. This is hardly arguable. To illustrate, if Palestinian civil society were to advise an end to non-violent resistance and shift to an armed uprising, would it be right for those of us who support their aspiration for freedom to jump on that bandwagon, or at least to remain silent and withhold our advice against it? As a reductio ad absurdum, clearly, if a majority of Palestinians supported not just legitimate armed resistance, but terrorist attacks and indiscriminate rocket attacks against Israeli population centers, we would clearly be wrong to stand by them in advocating such tactics, and hardly less wrong to choose to just remain silent about it and not criticize it out of some misguided sense of “solidarity”. I raised this point in correspondence with Mr. Falk, who agreed that the point about deference should not be used to stifle legitimate criticism of the BDS movement. He clarified that his own meaning was simply that Westerners must not adopt a colonialist mentality and act as if they know better than the Palestinians. We should act in solidarity, and not in a manner that causes resentment and factionalism. The problem I still see is that resentment may be no less difficult to avoid when criticism is offered humbly and respectfully than arrogantly and condescendingly. Mr. Chomsky’s criticisms, for example, are the furthest thing from Orientalist. Yet he still pisses people off because, well, people just don’t like to have their views or behaviors criticized, no matter how constructively. But sometimes a friend being honest with you and telling you things you don’t necessarily want to hear is the greatest expression of support they could possibly offer. In the context of BDS, Falk also acknowledges in Palestine’s Horizon that “imposition of sanctions by governments does raise some legal issues” (p. 79). Indeed, I would argue that inasmuch as economic sanctions by their very nature essentially constitute collective punishment of a civilian population for the sins, real or alleged, of the government under whose jurisdiction they reside, their legitimacy as a tactic is certainly questionable. This is no less true when the target of the sanctions is indeed a human rights violator. What about those Israeli Jews who oppose their government’s policy and stand with the Palestinians in actively pursuing an end to the occupation? What about the fifth of the population of Israel who are Arab? Should we agree to support a tactic that would hurt both of these groups, as well? At the very least, this is a legitimate question that warrants deep contemplation. Noam Chomsky has also observed that the BDS movement has opened itself to legitimate charges of hypocrisy, which in turn serve only to lend credence to Israel’s charge against the BDS movement that it is fueled by anti-Semitism. One prominent leader, for example, is known for advocating a cultural and academic boycott of Israel while himself studying for a degree at Tel Aviv University. For another example, many BDS supporters are typically fierce critics of sanctions, such as the US sanctions against Iraq and Iran, and rightly so; yet when it’s the civilian population of Israel, including the fifth who are Arab, who are harmed, somehow it becomes okay? 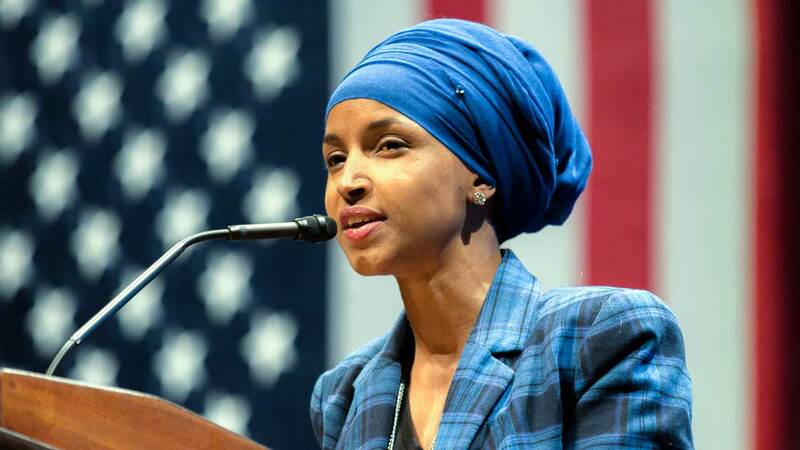 The apparent double standard does lend itself easily to the charge of “anti-Semitism”, which only serves to weaken the movement and prevent it from achieving its worthy aims. In my view, if the BDS movement is to truly have long-term success in achieving liberation of the Palestinians from Israel’s oppressive occupation regime, then its supporters must not shy away from addressing legitimate criticisms and be willing to evolve their thinking, both tactically and strategically. We must all strive to do better. One State vs. Two State Solution? This brings me to the second point on which my view differs from that presented in Palestine’s Horizon, which has to do with the popular rejection within the Palestinian solidarity movement of the two-state solution. This rejection stems from the popular association between “the two-state solution” and “the peace process”. Falk reinforces this association by treating Edward Said’s rejection of the Oslo process as synonymous with rejection of the two-state solution (pp. 131-132). Certainly, we are told by government officials and the thought-controlling media that the aim of the “peace process” is to implement the two-state solution. But the problem with proponents of a one-state solution reinforcing this characterization is that it unwittingly serves the occupation regime by obscuring the opposite reality, which is the fact that the “peace process” has rather been the means by which Israel and the US have long blocked implementation of the two-state solution. One-state proponents are certainly right to reject the “peace process” and its aims. But it is a fundamental mistake to equate that aim with the two-state solution, and this error has important strategic implications. As Falk acknowledges, the one-state solution is not presently a viable one. 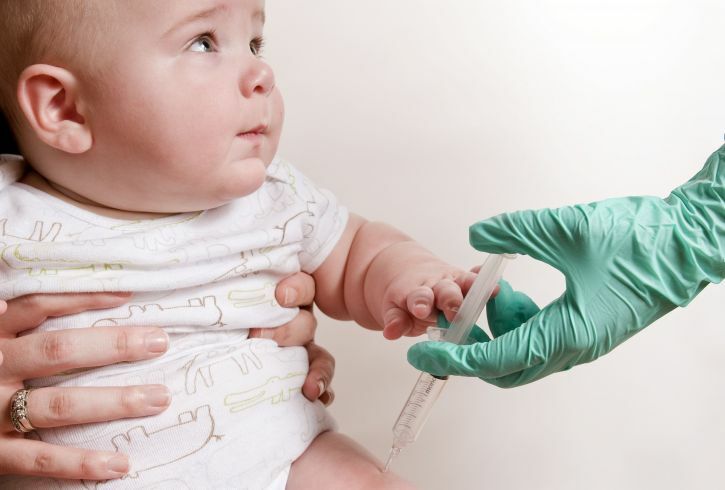 This raises the question of what can be done to make it viable. In my view, there is no path to a one-state outcome without first achieving an end to the occupation, which in essence means implementing the two-state solution. By rejecting the two-state solution on the mistaken grounds that this is what the “peace process” aimed for, one-state proponents are throwing out the baby with the bath water, as the idiom goes. I have elaborated on the fallacy of equating the two-state solution with the goal of the “peace process” in my article “The Two-State Solution vs. the ‘Peace Process’, and Why the Distinction Is Critical”, so won’t repeat my argument here. Suffice to say that, if a one-state solution is achievable, the two-state solution is a prerequisite first step toward getting there. I also raised this point in my correspondence with Mr. Falk, who agreed with me about the distinction between the two-state solution grounded in Resolution 242 and international law and the aim of the Oslo process. At the same time, he pointed out, the world’s governments have long been accepting of the Oslo framework. Be that as it may, I would argue that this is all the more reason to advocate, rather than reject, the two-state solution. The world’s governments should be reminded of their treaty obligations and the true meaning of Resolution 242 under international law. It should also be understood that nothing in Resolution 242 prejudices the internationally recognized right of Palestinian refugees to return to their homeland. As Falk writes, “inter-governmental diplomacy is not currently a pathway to a just peace”­; this rightly implies that, by effecting the necessary paradigm shift, it could become so. This brings us directly to another dimension of the Palestinian struggle Falk covers excellently in his book: the recourse to international legal mechanisms that have been available to the Palestinian leadership since Palestine was recognized by the United Nations as a non-member state on November 29, 2012. This has opened the possibility of the Palestinians pursing legal remedy for Israel’s crimes against them through the International Court of Justice (ICJ) and International Criminal Court (ICC) (pp. 91, 94). As Falk writes, “Considering this background of apparent Israeli criminality, it would seem a no brainer for the Palestinian Authority to seek the help of the ICC in waging its struggle to win over world public opinion to their struggle” (p. 99). And yet the PA has hardly made any progress on this front. Why not? Part of the answer is that the PA has been threatened with retaliatory measures if it tries to do so. The US and Israel clearly recognize that the Palestinians have international law on their side. As former US Ambassador to the UN and current National Security Advisor to President Donald Trump John Bolton once put it, “to convoke the International Criminal Court is like putting a loaded pistol to Israel’s head—or, in the future, to America’s” (see Obstacle to Peace, p. 158). But, then, such threats are largely a bluff since the US and Israel know they cannot risk collapsing their own agent in the occupied territories. That would leave the IDF alone to enforce the occupation regime, which would be expensive and messy; hence the Israeli military establishment’s objections whenever such threats are made or temporarily implemented. It’s also instructive that the US and Israel oppose recourse to the ICC, even though, as Falk observes, it would mean “leaders of Hamas could well be investigated and indicted for their reliance on indiscriminate rockets aimed in the direction of Israeli civilian targets” (p. 102). Another part of the problem is the ICC itself. As Falk notes, the PA did appeal to the ICC in 2009, after Israel’s devastating 22-day military assault on Gaza dubbed “Operation Cast Lead”. The PA was rebuffed on the grounds that the ICC had no authority to determine whether the PA represented a “state”. Palestine has since been recognized by the UN as a state and in January 2015 acceded to the Rome Statute of the ICC; and yet still three years later, the ICC remains only in a stage of “preliminary examination”. This illustrates a basic problem with the enforcement of international criminal law. It has been effective only against the losers in wars or those whose crimes are in countries of the South. This has been true since the first major effort was made after World War II at Nuremberg and Tokyo, holding surviving German and Japanese leaders responsible for their crimes while exempting the winners, despite their responsibility for the systematic bombing of civilian populations by way of strategic bombing and the dropping of the atomic bombs on Hiroshima and Nagasaki. Unfortunately, up to this time, the ICC has not been able to get rid of this legacy of “victor’s justice,” which has harmed its credibility and reputation. All ICC cases so far have involved accused from sub-Saharan African countries. The refusal of the ICC to investigate allegations of war crimes in relation the Iraq War of 2003 is a dramatic confirmation that leading states, especially the United States, possess a geopolitical veto over what the ICC can do. “Despite all these problems,” Falk concludes, “recourse to the ICC remains a valuable trump card in the PA deck, and playing it might begin to change the balance of forces bearing on the conflict that has for decades now denied the Palestinian people their basic rights under international law” (p. 103). I certainly agree with that assessment. But this brings us to a third major problem, which is the PA itself. The Palestinian leadership under the illegitimate presidency of Mahmoud Abbas (whose term expired in 2009) has proven all too willing to collaborate with Israel in maintaining the status quo. As one clear example, when Hamas won legislative elections in 2006, Abbas and his party, Fatah, conspired with the US and Israel to overthrow the elected government. The result was that Hamas expelled Fatah from Gaza, while Abbas remained in power in the West Bank. The political elite within the PA live relatively comfortable lives compared with the people they claim to represent. Why would they risk upsetting the balance in a way that could risk them losing their privileged status, attained from their service fulfilling the PA’s purpose under the Oslo Accords? A final problem is that, as Falk observes, Israel is not a party to the Rome Statue of the ICC and would surely not cooperate with any inquiry into the legality of its policies (p. 100-101). Yet, if the obstacle the Palestinians face in their own leadership could be overcome, Israel’s non-cooperation would ultimately become a moot point. Once Israeli leaders fear leaving the territory under the Israeli government’s control lest they be arrested for war crimes, the end of the occupation will be in sight. “[U]ntil the time comes when Israel assumes moral responsibility for what it has done to the Palestinian people,” Edward Said once said, “there can be no end to the conflict” (p. 121). That may seem like an unlikely outcome. And yet, as Falk rightly observes, “there is reason to believe that Palestine is winning the Legitimacy War, and that this could create a situation where surprising developments occur that recalibrate the balance of forces in favor of the Palestinians” (p. 140). Mr. Falk has done us a great service by helping to empower us through this book with the understanding we need to effect the paradigm shift that is necessary for a just peace to be realized. There remains yet much work to be done. For the Palestinian solidarity movement, there remains the question of how to actually realize the ideal solution of a single, democratic state. Specifically, in terms of overall strategy, there is the question of whether the two-state solution, properly understood within the framework of international law, is a necessary first step, or can somehow be bypassed. Second, within whichever strategic vision is most realistically achievable, there is the question of which tactics are most effective while remaining in accordance with international law and the universal moral principles it reflects. I would encourage all of us to take responsibility for making the impossible possible when it comes to the pursuit of a just outcome for the peoples of Palestine and Israel. We must not be misled by accepting the (mis)guidance of self-proclaimed realists who continue to shape the policies of government, proclaiming that the achievement of justice and genuine peace is unattainable for the Palestinians, and indeed for the peoples of the entire Middle East. It is the task of citizens of conscience everywhere to think and act otherwise.